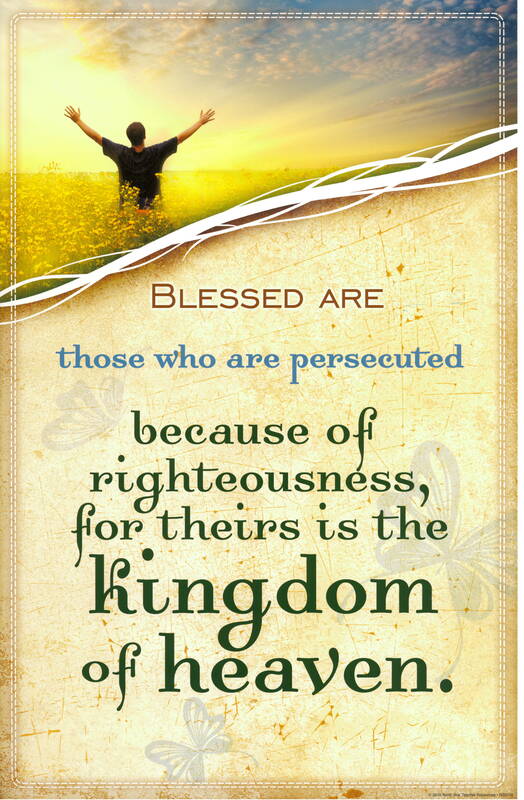 God blesses those who are persecuted for doing right, for the Kingdom of Heaven is theirs. “God blesses you when people mock you and persecute you and lie about you and say all sorts of evil things against you because you are my followers. Be happy about it! Be very glad! For a great reward awaits you in heaven. And remember, the ancient prophets were persecuted in the same way. Lord we come to you today, we are hurt, we are bleeding, we are crying out to you. These pains that we feel run deep down to our hearts. We know that You Lord Jesus are the only one who can heal and that You know personally what it is to be rejected, spit upon, deceived, lied to, lied on, pushed away and alone in this world. We are Your servants and have been out on the front lines of the battle, today we sit at Your feet to learn from You to be healed so that we can stand and fight again for we know the battle is NOT over. We love You, we praise You and we lift You up today. In the name of Jesus Christ our Savior, Amen. Last week in our ladies Bible Study Connection Group – we were studying the book of Matthew in chapters 5-6. I was very excited about studying chapter 5 as this is the famous chapter of “The Beatitudes” when Jesus spoke on the mountainside. I do so love reading about God’s blessings on us. I was not sure what all I was going to learn, since I have read it multiple times, but I had a sense of expectation in my spirit. Little did I know that in a few short days after our study that I would be shot from behind by friendly fire. The details of what was said and done are not as important as how as a Warrior Bride of Christ I was to respond to being shot at by family. At the time of the incident, I heard the shot, I outwardly responded peacefully, I ducked. Since I was aware that it was friendly fire I did not turn around and shoot back, I stayed down and prayed to the Lord to give me discernment on how to handle dealing with the situation. However when I tried to stand back up, I realized that I was not just shot at, but that I was indeed wounded and bleeding. I cried out to the Lord for my pain was great, but all I seemed to feel was the pain and as I tried to check my wounds my hands were covered in my own blood. Tears coursed down my face, sorrow racked my body as I kept looking at my wounds, all I saw was the blood. I could not get up on my own. A few other Warrior Brides came to where I was but they were not strong enough to get me back to the first aide tent. They prayed for me but had to go back to their places in the battle so that the enemy could not make any inroads. A general in the Lord’s Army, fellow warrior in Christ Jesus, came nearby and heard my cries. For this writing I will refer to him as Warrior John, he was able to cover me in prayer and lift me up to our Father-King and take me to the first aide tent so that my Warrior Husband Donnie would be able to find me, tend to me and help me begin to heal. You see left alone on the battlefield, shot down by friendly fire, my wounds could have gotten infected. Left alone to tend to my own wounds, bitterness, resentment and hatred could have come into my heart and weakened me to a point where I could never be on the front lines again. I can’t explain why I was shot down by friendly fire, I don’t need to go and reason with the person that was careless with their weapon. I need to make sure that I allow our Father God to heal me completely so that I can become strong to fight again! The battle is raging and there are many souls that do not know our God, many that need Him and I am God’s Warrior Bride – equipped to wage battle with the enemy for souls for my King! When my husband arrived at the first aide tent, he listened intently to my account of the attack. He heard about Warrior John’s prayers over me and his admonishment for my husband in how he is to pray words of protection over me for the battles yet to come. He was able to wrap me in his arms of love and gentle put his hands on my heart as he prayed to our Father King to heal and make me whole. Not just these recent wounds, all the wounds from the past as he saw the scar tissue from wounds long ago that his Warrior Bride had sustained. He prayed for God to restore my heart and let it be filled to overflowing with forgiveness, gentleness, kindness and love. Words do not do justice to the healing power of God! As my Warrior Husband lifted me up to our Father King – the Lord reached down and touched my heart. Mind you I am still in recovery. I am not yet up to full strength, God sowed in compassion, meekness, mercy and peace on top of the things that my Warrior Husband prayed for. See the thing about God is – bring Him all you have and He will give you more than what you came with. God has shown me how great His family is. My Warrior Husband had to return to the front lines, and he will check in on me as time and the Lord permits but I am not alone. Warrior Brides and Maidens have visited, called, txt and emailed, bringing Good News of our Father King, sharing of their skirmishes in battle, and praying with me for a rapid recovery and full strength that I may fight by my Warrior Husband’s side again soon! Today I can say that yes I am happy! Happy to be persecuted for following God’s lead; walking in love towards all that cross my path – family, friends, acquaintances and enemies, even while wounded by friendly fire. God is so very, very good to me and I know that He is good to you as well. This walking in love and using weapons only from God’s arsenal is against my human/natural instincts – but I am already receiving the benefits of obeying our Father King. Healing is going along much faster and the Joy of the Lord is truly my strength! When we trust in God with our all, when we submit fully to God’s love for us – we don’t need to defend, shout, or argue with our friends and family. When we are wounded – call out to our Father King; Crushed but not broken, Wounded yet alive, Crippled yet crawling to His throne – He will hear our cries and reach down from heaven to heal our wounds. I have given my wounds to our Father King; will you bring your wounded heart to Him? Will you let our Father King touch that wounded place, clean out the infections creeping in and make you whole again? He loves us so very much and wants us to live abundantly. I am healing, I feel His strength making me whole and I will be fit for active duty again real soon. I pray that you let God touch you today and let the healing process begin to live the Abundant Life in HIM! Wounded yesterday, Healing today, Ready for Battle tomorrow, in the name of Jesus Christ! This entry was posted in Comfort, Console, Beauty, Oil of Joy and Garment of Praise, Healing, Love, Rebuilding, Testimonies and tagged All For HIM, Father God, God, Gospel of Matthew, Jesu, Jesus Christ, Jesus the Healer, Kingdom of Heaven, Lord, Matthew, warrior bride, wounded by friendly fire, wounded in battle. Bookmark the permalink.